Modern Bathroom Mirrors: Magnifying Cosmetic Vanity Mirror with Light. 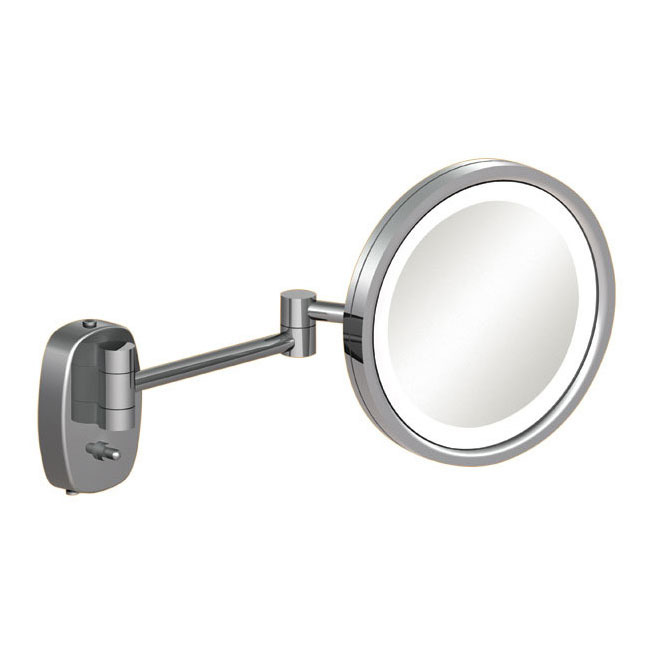 These attractive wall mounted make up and vanity-styled magnifying mirrors are simply perfect! This lighted bathroom wall mirror features 72 state of the art LED halo lights with a life of 50,000 hours or more! With an average usage of 1 hour per day, this translates to more than 130 years! So you will never have to change another light bulb. This vanity makeup mirror has a magnification of 500%. This sleek and stylish cosmetic mirror is a functional item for everyday use. The unassuming contemporary design is perfect for use as a bathroom mirror, cosmetic mirror, magnifying mirror, makeup mirror, shaving mirror, etc. This mirror features features a solid brass construction with 360 degree lighting, 5x optical quality glass, and fog-free optics. The mirror swivels and tilts in all directions. The 72 LED lights inside the mirror provide cool, energy-efficient, bright, "true white" lighting (draws only 3 watts!). This mirror was designed to operate on any electrical input in the 100-240 Volts - 50/60 Hertz range so it can be used virtually anywhere in the world. Available in hard-wire models in your choice of three luxurious finishes. This LED mirror is an excellent option for someone wanting a high-quality shaving mirror or even a downsized stand-in for the traditional vanity mirror or mirrored medicine cabinet. This mirror is UL listed for use in househould and commercial applications. This mirror also meets UL, CSA and EN safety standards, California Title IV requirements for energy consumption, are RoHS compliant and are lead and mercury fee. 100% Lowest Price Guarantee on this product. Usually ships in 2 to 6 business days.